Here is some breaking news on the very well know lottery system called The Silver Lotto System developed by publisher and marketer Ken Silver. Ken Silver claims that his Silver Lotto lottery system will give all lottery players a big edge at winning the lotto, as it gives players a 98% win rate which I found to be very suspect! I wanted to get the real truth about this silver lotto ebook system that many reviews are stating it works. I went to almost every review posted when googling Silver Lotto System Review and the results were page after page of 90% good reviews and 10% bad reviews. I checked out every review going back about 7 pages in search results and found some very interesting insight to why all the good reviews. Did this mean that the silver lotto system was winning lottery games and making people rich? No, what it really ment was, is all the good reviews were by affiliates or other marketers selling the system for commission, hence why they tell you it really works great. This is very disturbing to see as people are getting fooled or mislead by these fake silver lotto reviews. None of these reviews are actually winners who used the system, as a matter of fact, I could not find any person who has used the system and won with it, including Ken Silver and his boasting of winning the big lottery jackjpot of 2.7 million, it simply is not true! If ALL of the review sites that are not selling his products claim Ken Silver is an untrustworthy seller, they are receiving many complaints about him and his lottery systems. If you notice on the silver Lotto website all photos of Ken Silver’s winning lottery tickets are not clear, you cannot see them to verify if real or not, just a ploy to mislead you once again. 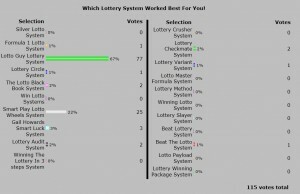 We actually tested the Silver Lotto system to see what win rates we would receive using the highly praised system. We played 2 lottery draws per week for 1 month, using the system as directed. We spent $20 per lottery draw ($40 per week) After testing the system out for one month, we won nothing at all with Ken Silver’s Silver Lotto System. Where is the claimed big 98% win rate? Ken Silver says you will win 8 out of every 10 draws using his expert winning system he designed, we won SQUAT! So after all of the reviews looked at, posts read in forums about people losing with the system and our own in house testing of the system, we find all evidence indicates, that the Silver Lotto System is a total FRAUD! We have tested many lottery systems, most turn out just like the silver lotto test, they win nothing. We did however find a few systems that did work as advertised and did win us money during our testing. The best winning system we ever tested was the Lotto Guy Lottery System. Don’t be tricked by these silly useless lottery systems with totally outrageous win rates such as the Silver Lotto System, they simply do not work as advertised and win only waste your money, not win you money!